Glasgow City exited the Women's Champions League despite drawing with Fortuna Hjørring and creating better chances in a goalless second leg. Fortuna take their place in the last 16 for the fourth straight season courtesy of their 2-1 win at Petershill Park. Jane Ross struck the post on the turn early on for the Scottish champions and that set the tone in Denmark. The Scotland striker, Danica Dalziel and Leanne Ross all forced fine saves from Maria Christensen after the break. City defeated Valur Reykjavik in Iceland after drawing the first leg at the same stage in Glasgow last season. But, if they were to progress to the last 16 for the second time in their history, the Scots amateurs needed to score at least twice against the side ranked eighth in the Champions League. And the visitors showed their intent early when Jane Ross met Emma Mitchell's low cross to the front post and sent it against the outside of the upright on the turn. Ross flashed a header wide and Dalziel fired across the face of goal, while Eilish McSorley headed over from only a few yards out following a corner. Ireland striker Ruesha Littlejohn fired powerfully but straight at Christensen from the edge of the penalty box, but Fortuna survived to remain level at the break. Denmark striker Nadia Nadim, who scored a double in Glasgow before Ross reduced the arrears, sent a header wide as Fortuna looked to kill off the tie. However, after an uncertain start to the second half, City resumed the flow of attacks towards the home goal. Dalziel's fine header was well held by Christensen and Ross forced the goalkeeper to turn the ball wide with a thundering drive from 20 yards. Scotland midfielder Leanne Ross forced another good stop with an effort from just inside the penalty area and Dalziel sent a long-range shot wide. When Mitchell sent another powerful drive straight at Christensen with a couple of minutes remaining, Glasgow's chance was gone. Fortuna were able to celebrate after a professional rearguard effort while the visitors were left to rue a tentative first-half display at Petershill. 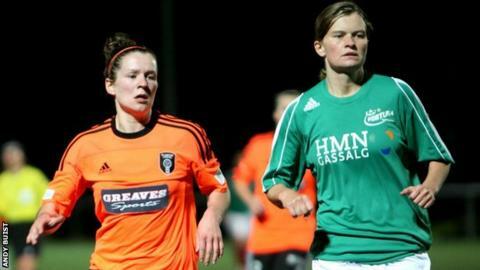 Glasgow City head coach Eddie Wolecki Black: "The best team has gone out of this competition. "Over the two legs, it has been our performance in the first half of the first leg that has cost us. "You look at the performance of their goalkeeper again, who was the busiest player in their team and it says it all. "I think the girls have done their country proud. They are all still very young and they will learn from this and be better. "The challenge for them now is to go on and win the league and be back here again next season."